Keys to the Magic Travel: Picture of the Week: Disney is not just for kids! Today is the last day to book a trip to Disney with Mickey picking up the tab for meals! If you travel between August 24 and September 29 you can get free dining during your stay. It's a great time to go because with school back in session, the parks are not too crowded. Also - don't forget to enter my first giveaway - and win a Disney parks lanyard + eleven pins to start your pin trading adventure. Last year, I took a mom's trip with two great friends - we had free dining and great amounts of fun - all leaving our kids at home for TEN days! I highly recommend an adult trip - whether it's a long one or just a long weekend. It's such a different dynamic - and one that I can't wait to repeat again this fall. Please email me at disneykatrina@gmail.com and we can talk details about your next trip to the World! 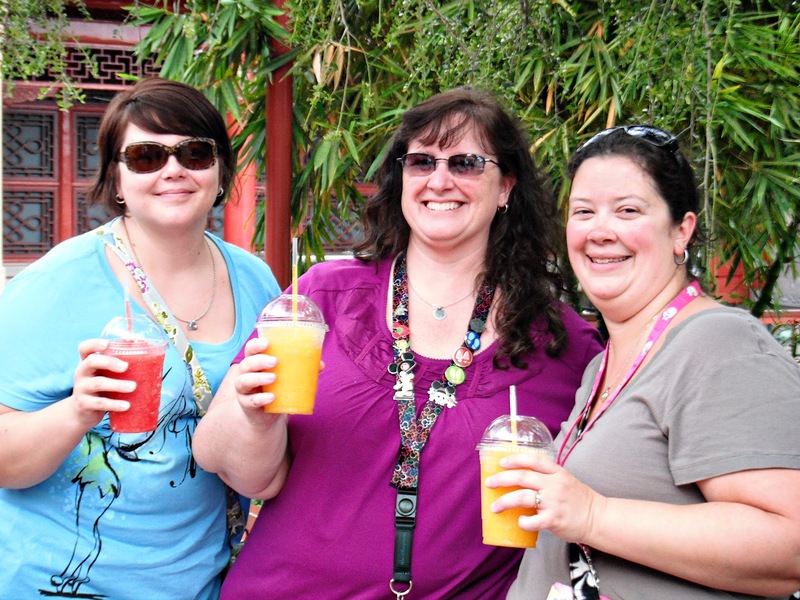 Oh, look at us with our yummy smoothies! I'm looking forward to my anniversary trip this fall... and to see how Shane will feel about being at WDW without the kids! And we need another mom's trip. LET'S DO THIS. Disney is really the best place of all ages. Nothing is more fun than being back as a kid. In Disney, I experienced being back as kid playing with my kids.Better have a Stroller > in Orlando to avoid the hassle. How did I miss this post? I love you girls! Such fun, such fun! I don't even mind to admit that my "Grown ups only" trip to Disney was my favorite. Scott & I were able to do so much more than usual, because there was no need for numerous bathroom breaks, parking the stroller, having to ride Dumbo and the carousel, keeping track of everyone at all times, character meals, etc. Plus...there was the whole drinking around World Showcase aspect. Ahem! Fun!